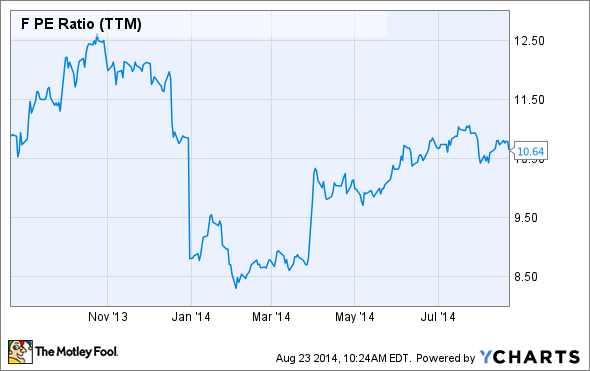 Why Is Ford's Stock Up 12% This Year, and Can the Gains Continue? Ford's stock has enjoyed a nice 2014, climbing roughly 12% and outpacing the S&P 500. But can investors expect more gains to come? Ford's 2015 F-150 needs to do well in order for the stock to continue rising and to keep investor confidence high. Photo source: Ford. Shares of Ford (NYSE:F) have spiked roughly 12% so far this year. The automaker's stock has outpaced the S&P 500's 7.5% climb, as well as the stocks of competitors Toyota and General Motors (NYSE:GM), which are down 6.5% and 16.5%, respectively. What is leading Ford's stock price up this year, and more important, are there more gains to come? First, sales in China have exploded. Although General Motors and Volkswagen cemented their roots in the nation nearly two decades ago, Ford is playing catch-up -- and doing relatively well. In 2013, Ford's sales in China climbed 49% to 935,813 units; they are up 35% in the first half of 2014, to 549,256 vehicles. General Motors saw sales there rise a less robust 10.5% in the first half of 2014, but that involved a far larger 1.7 million units. Ford noted in its latest earnings conference call that it expects the Asia-Pacific region to earn a higher pre-tax profit for the full year compared to last year. Also, European operations -- which have been a massive black hole for Ford over the past several years -- reported a profit in the latest quarter for the first time in over three years. In the conference call, Ford management said the company is on pace to report a profit in Europe for 2015. This has been expected by shareholders for some time, and this anticipation also likely played into the stock's outperformance to date this year. It doesn't hurt that Ford pays a handsome dividend, currently yielding about 3%. In addition, its valuation has not been egregious, particularly at the start of the year. As you can see, shares of Ford had a relatively low trailing price-to-earnings ratio earlier this year. Likewise, Ford's current P/E ratio of 10.3 is below the industry average of 12.4 and the S&P 500's average of 18.2. It's also worth mentioning that its five-year PEG ratio of 1.04 suggests that the stock is fairly valued, and helps justify this year's run in the price of shares. Investors who want exposure to the auto industry might also feel more comfortable investing in a company like Ford, which isn't plagued by lawsuits and a record amount of recalls like General Motors is enduring. Although these issues have not slowed GM's sales, they have certainly weighed on the bottom line. In December, Ford management told investors that pre-tax profits would likely land in a range of $7 billion-$8 billion in 2014, down from $8.6 billion in 2013, as the company focuses on launching 23 new models globally. Perhaps more important, Ford was calculating exactly how it would handle the big change to its premiere F-Series lineup, the top-selling vehicle in the U.S. for the previous 32 years. For the 2015 model, the company plans to use an aluminum body, reducing the vehicle's weight by some 700 pounds and boosting fuel efficiency. After initially trading lower on this revised profit outlook, the stock has performed relatively well. I think part of that is because investors seem to have grown not only comfortable with some of the changes and risks associated with the F-Series modification, but excited about them as well. Another reason investors might be excited for the new pickup -- aside from the opportunity for higher sales -- is that Ford's main competitors are years away from duplicating a similar technology. Of course, if the aluminum-bodied truck fails to excite consumers or has supply or pricing constraints, then perhaps the competition will be glad they are behind the curve. On the other hand, if it's as successful as investors hope, then Ford will have a multiyear leg up General Motors' Chevrolet Silverado and Fiat's Chrysler Ram. From Ford's luxury line, the Lincoln MKC. Source: Ford. General Motors plans on switching to aluminum body panels in fall 2018. Chrysler plans to do so in 2020, if it feels it will give the company a competitive advantage. Over time, we'll see how this plays out, but there are risks. Any major setbacks for Ford could be devastating considering how critical the F-Series is to its bottom line. Nevertheless, investors seem excited about its prospects. Ford is making short-term sacrifices for long-term gains. Meaning, executives decided that when times are good, such as now, they should focus on enhancements for the future. In my mind, no single event got shares moving higher in 2014. By avoiding major litigation and recall issues like those slamming GM, having a low valuation and dividend, and launching exciting new products, Ford has gotten investors quite excited for 2015 and beyond. Barring any hiccups in the global and domestic economy, or in the production of the new 2015 F-150 pickup, I see no reason for Ford's stock to slow down anytime soon.